This coat is made of polar fleece for a soft and cozy fit. Nothing is better for keeping pets warm and in sight during cold weather walks. Easy-fit design with buttons. Preferably Suitable Dogs: such as golden retriever, Samoyeds, Akita, Labrador retriever, brittany spaniel, Huskies, bulldog, collie, schnauzer, springer spaniel breeds, etc. 1. Machine washable in cold water, line dry and easy care. 2. Doing laundry separately helps to prevent color fading. Place the coat in the shade to dry. Size: 7XL fits 25" dog Neck Girth to 32"-33.5" dog Chest Girth. Material: Here comes a type of natural, skin friendly, healthy, fashionable, cute and elegant big dog coat! With Hood and tail design, this designer pet outfit will bring both style and comfort to the most playful member in your family. 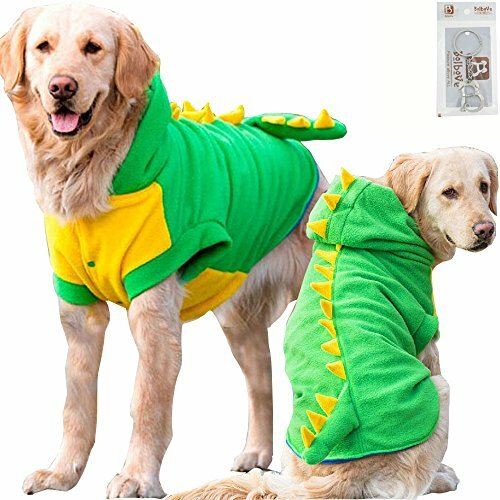 With Hood and tail design, this designer pet outfit will bring both style and comfort to the most playful member in your family. If you have any questions about this product by Bolbove, contact us by completing and submitting the form below. If you are looking for a specif part number, please include it with your message.